As is usual, there has been very little, in fact no news, from Societies around the world. Does this mean that there are no Connemara Ponies working and performing, or, just that no one has the time or interest to report on their ponies and their activities??? Given the above, readers will have to accept that which is readily available! There is a gorgeous article from an owner of the Pony that has won the “Jo Heard” trophy down under. 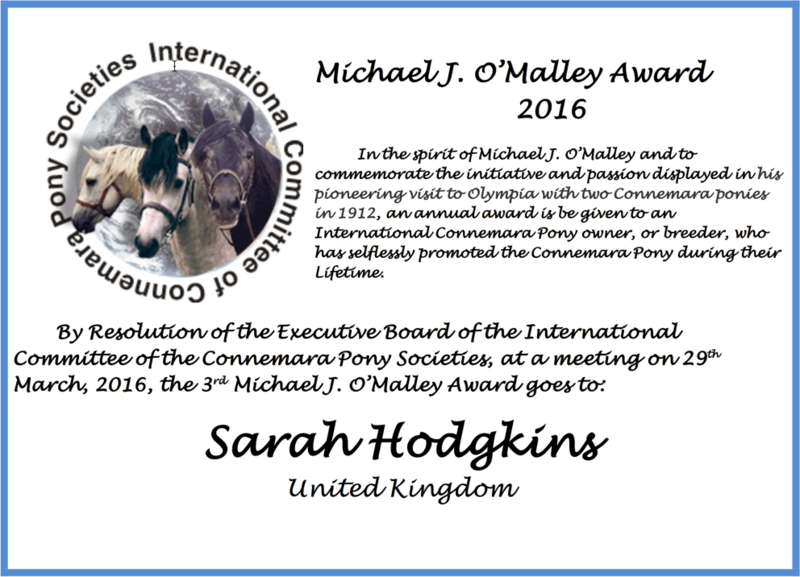 I shall send the full article for presentation as it indicates several things, the ability of the Connemara, the joy of a child competing and then the absolute pleasure of the owner who took the pony under her wing and competed not just “in Hand” but at ODEs! State Royal Shows have been well supported by the Connemara owners. 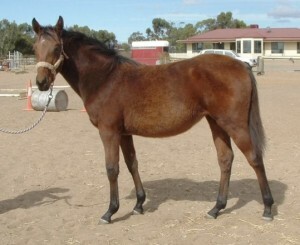 Perth Royal led mare went to “Margylyn Lady Gwynne” owned by J Rockman. Stallion Class was awarded to “Clare Downs Outlaw” prepared by the Clare Downs Stud and this Stallion was also awarded Champion Connemara with “Glenormiston Dundrum” taking out the reserves ribbon. In South Australia at the Kapunda Show Led Pure bred Colt /filly was awarded to “Gracefield Park Dr. Doolittle”; led Mare was taken out by “Newlands Winsome with “Glenormiston Rosanna” accepting the 2nd place ribbon. “Newlands Winsome” was awarded Champion of the Show. In Victoria the Geelong Royal Show saw a strong field of Connemaras competing. Led mare was awarded to “Kahean Snow Blossom”. Led Stallion ribbon went to “Gracefield park Mr. Ed” and the led pure bred gelding ribbon was awarded to “Kahean Knight Storm”. Champion Connemara at Geelong was awarded to “Gracefield Park Mr. Ed”. Ballarat, Victoria ran a Mountain and Moorland pony show that included Fell, New Forest and Connemara ponies. M&M Male class saw “Kahean Knight Storm” taking home the First ribbon with Connemaras taking the first 4 placings in this class. News from Britain also indicates a strong representation of the Connemara pony in competition. One most interesting note that I received was concerning the Eldwick Riding Club’s Quadrille team. 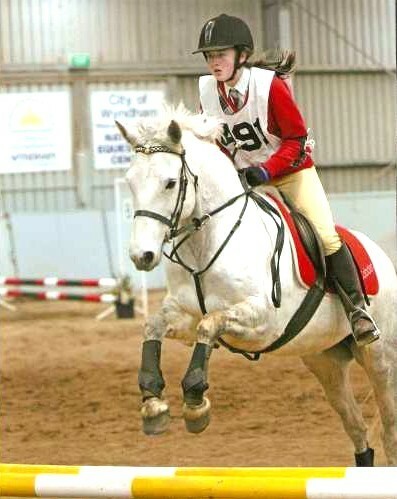 This group competes on a team of Connemara ponies all of which have competed successfully at Dressage, Working Hunter, Show Jumping, Pony Club and general showing. After some trepidation in preparation the team was entered in the British Riding Clubs SEIB Quadrille Selection trials. With Connemara ponies as their mounts the team chose an Irish theme to the music of Lord of the Dance! The team was called back into the ring for the final placings to be announced. One can imagine the joy when “Eldwick Riding Club” was announced as the fourth team that would go to Olympia. 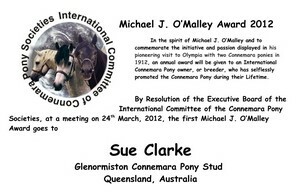 What a great triumph for the Connemara pony and the riders who competed on them! The British Connemara pony Super Sunday saw a Stallion Parade of 30 Connemara pony Stallions. These ponies ranged from mature aged Males down to recently inspected and graded Colts. Some were shown in hand and some were ridden. Also on Super Sunday was a 2 hour long “Showing Clinic” and this was followed by an “Open Jumping Clinic”. From the reports on “Super Sunday” it is obvious that many people gained considerably from all aspects of this wonderful day. With winter now well settled in the Northern hemisphere very little news of the Connemara pony will be forthcoming for a while. 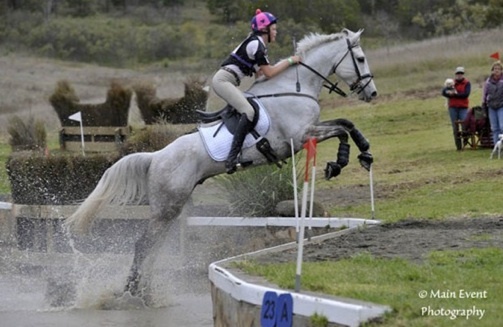 Down under, The Connemara Part Bred has once again indicated its capabilities with a strong performance by yet another part bred Connemara in the prestigious Adelaide International Horse trials. Last year saw “Exmoor Truffles” competing in the CC1 2 event and whilst not finishing in the placings competed extremely well in all sections. 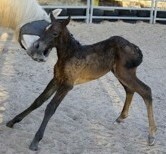 In 2011 yet another part bred “Feedale Mouse” competed in CC1 2 produced yet another confident round. Placings in this class are hard to determine as yet but I shall follow this up and try to get a final result for those who are interested. May I take this opportunity to wish all Connemara pony owners, enthusiasts and riders the very best for the Christmas period. May the year 2012 be a happy riding time for you all and may your ponies produce many wonderfully keen and talented off spring to take you further into Connemara performance areas as yet untouched by you! Click here to read view the PDF of this post. 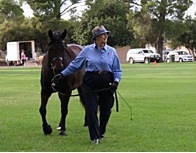 Connemara People in Victoria had a real treat served to them recently when the extremely well know and highly talented Horseman Manola Mandez presented a demonstration of Classical training using Connemara Ponies. Manola’s training is extremely interesting as he combines work in-hand, with his deep understanding of Equine Chiropractic methods, to help the rider better communicate with the Horse/pony once under saddle. Manola Mandez’s background is unique. 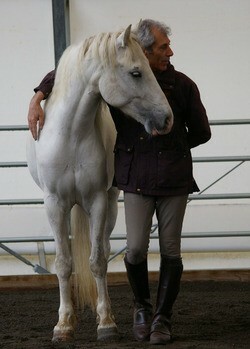 He was one of six founders of the Royal School of Equestrian Art in Jerez, Spain. In 1978 Manola was invited to come to Australia by Ray Williams of R.M. Williams, Stockmen and Horse outfitters, to be a Director and Head Riderat the El Caballo Blanco Equestrianne school in Perth, WA. He was later director of El Caballo Sydney. Those in Australia who can remember will know of his star performer at these establishments was non other than a Connemara Stallion Kemill GHill Spinnaker, bred by the late Alan Longman of Western Australia. I had the pleasure of seeing Spinnaker and Manola perform once when in Adelaide and the manner in which this man was able to establish his routine with Spinnaker has never left my memory. Manola now lives in Sunbury, Melbourne, Victoria as teaches overseas and throughout Australia. Breed and so the ability of our Connemara ponies to excel in all formats of Equestrian sport and in particular Dressage is something that Connemara owners and Riders all over the world should recognize and ensure that the Connemara is given a broad opportunity to show its latent talents. The continuing development of the Performance Connemara and the results of the varied performances in a broad spectrum of events, including Dressage is there for the Doubting Thomases to see! And repeat!!! Another item from the scrap book centres on the legendary part bred Connemara “Grasshopper” He started life as “Copper Coin” and competed for Ireland in the 1956 Olympic Games in Stockholm. He had a clear show jumping round but was eliminated for missing a flag. He was sold to Californian interests where his name was changed to “Grasshopper”. 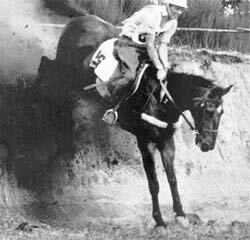 Ridden by Michael Page he had an excellent career with individual gold in both the 1959 Pan American games in Chicago, and the 1963 Pan American Games in Sao Paulo, Brazil. The career continued to the Rome games in 1960 and the 1964 games in Tokyo where “Grasshopper” was on the silver medal team. 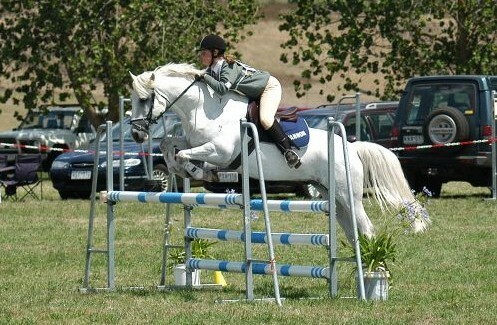 This Part Bred Connemara is known as only one of five horses in the sport to have competed in six or more CCIOs. 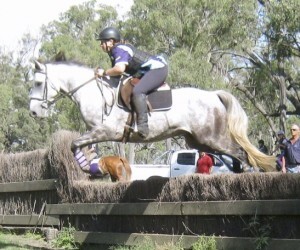 In glancing through CPBSA action Groups newsletter it is very pleasing to see so many younger riders preparing their ponies and part breds for all aspects of performance competition down under. Dressage, Eventing, Trail, Harness. The Performance Register and its rewards is beginning to be seen with the numbers of new and younger riders preparing their ponies for all facets of Equine participation. Another interesting aspect is the number of Connemara owners and enthusiasts that are now travelling to Clifden to the Show and to tour Connemara. It appears that the Connemara Pony is travelling well “Down Under”. 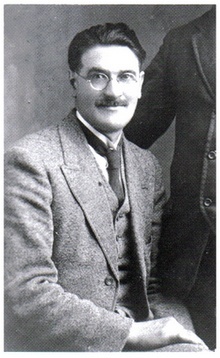 John Tennant, ICCPS Publicity Officer. Many thanks to Jean Dart, Victoria for information sent!